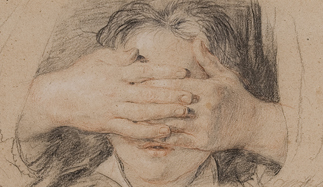 Works like this drawing by Sir David Wilkie are light sensitive and cannot be displayed year-round. The Field Museum's Alan Francisco shows reporter Katie Klocksin and question asker James Kowalski ancient architecture from Kish. We continue to serve up answers from our first-ever Curious City trivia bowl, which took place late last month. If you missed it, have no fear; we’ll likely do another one in 2013. For the trivia bowl we took 10 questions posed by curious citizens. Each was bite-sized in scope; the answers, though, provided plenty to chew on, and we’ve got three of them ready for you. Another bunch includes: how much the city spends on ornamental planting, the location of Chicago’s oldest sidewalk, and why ketchup’s taboo when it comes to Chicago-style hot-dogs. Curious City: Amount of items in the collections of the Field Museum and Art Institute? from WBEZ on Vimeo. How many objects do the Field Museum and Art Institute have in their collections at any given time, and what percentage of that is on display? This question required some serious legwork, enough that we had to break out of the cubicles. Freelance reporter Katie Klocksin accompanied James to get some answers at the Field Museum, and she got the skinny from Art Institute as well. We’ll give Katie’s treatment pride of place on our website soon, as she dug up some great details that deserve more time, but in terms of answering James’ question about art, here’s the gist: The Institute has approximately 270,000 works of art in its collection, and just 3-5 percent of that collection is exhibited at any given time (equal to about 8,000 items). As for the Field Museum, Katie and James found there’s a storage site beneath the building. During a visit there with Curious City intern Logan Jaffe, they learned the Field Museum has 25 million artifacts and that less than 1 percent of their collection is on exhibit! (Yep. We feel that fact deserves an exclamation point). Turns out most of their artifacts are used for research and aren’t intended for display in the first place, according to John Bates, the Associate Curator of Birds. This is especially true in the zoology department, where the group saw jars of frogs and drawers full of birds for study. But according to the anthropology department’s collections coordinator, Alan Francisco, weight can also be a factor for display. Francisco showed Katie, James and Logan the room where particularly large anthropological items are stored, including a sarcophagus that had to be kept in the basement because it was too heavy for the museum floors. He said the museum used to put nearly everything in the anthropology collection on display, but as the collection grew they weren&apos;t able to accommodate everything and now much of it sits in a vast storage area. The room is tightly secured and has an elaborate ventilation system to ensure objects remain dry and at the right temperature. 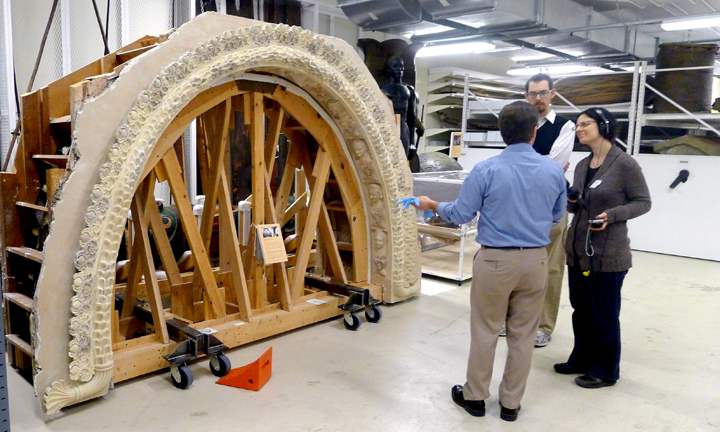 Francisco showed them an incredible array of objects, including a stucco arch from the ancient city of Kish, just South of modern-day Baghdad. Curious City: Where do the Bulls players live? from WBEZ on Vimeo. I kinda want to know where all the basketball players live ― because it’s either on top of a tall building or in big a house way far away from all of us and I just don’t know which one it is. We were surprised to find out that they really only live in three areas, according to WBEZ sports blogger Cheryl Raye-Stout. She said they’re in Chicago’s Loop, but some are also in Northbrook, in particular the permanent players who have houses. Cheryl added there’s a third group in Deerfield, right by the Berto (practice) center. There’s a hotel there, she said, and that’s where players without contracts tend to stay. I spoke with Cheryl before news broke about a new Bulls practice facility downtown United Center. She says once the facility is ready in around two years, she expects a lot of current players won’t be with the team anymore and the others will likely move downtown or closer to the new practice space. Curious City: The first non-wooden building in Chicago from WBEZ on Vimeo. We picked the brain of Chicago’s Cultural Historian Tim Samuelson for this one. He knew right away and said it was a gunpowder magazine (a kind of storage building for weapons) at Fort Dearborn circa 1803-1808. Of course the original Fort Dearborn structures have long since disappeared, but there are some in-ground plaques at the intersection of Michigan Avenue and Wacker Drive. And if you’re jonesing to see a miniature model of it, head to the Chicago History Museum.